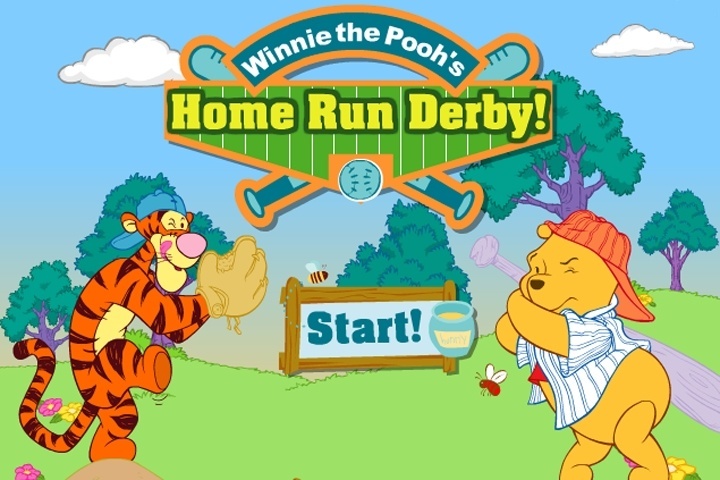 Try to score home runs off your pals from Hundred Acre Wood in the game Winnie The Pooh Home Run Derby. As Winnie the Pooh you have to hit the baseball as far as you possibly can! Choose a level. You can always go back and re-play levels you've successfully completed. Move Pooh with the mouse. Keep an eye on the ball, take aim and click to swing. Try to hit the ball with the middle of the bat to really make it fly! Clear the level by hitting the target number of home runs show on the screen. After you clear a level, you can advance to the next one from the Level Select screen. The more home runs you hit and the farther they fly, the more bonus points you'll earn. The valuable bonus points will help you boost your skills. Check out your results on the end screen. Check your status by clicking on the Status button from the Level Select Screen. On the Status screen, you can see your records and use Bonus Points to boost your skills. Increasing your Power means you'll be able to hit the ball farther. Increasing Contact makes it easier to hit the ball. Speed helps Pooh move more quickly so even curve balls are more easy to hit. If you want to play Winnie The Pooh Home Run Derby games online you have come to the right place! GamesLoon adds new Winnie The Pooh Home Run Derby games every week. This is your game portal where you can find the biggest collection of free Winnie The Pooh Home Run Derby games online. Do not forget to rate our Winnie The Pooh Home Run Derby free online games while playing!